Love has a way of being painfully dissatisfying at times, and yet surprisingly, life alteringly satisfying when we least expect it. This half mockumentary, half indie romance follows that pattern while telling the tale of two people whose love is at first separated not just by geography but life in general. Anderson (Alex Holdridge) has spent the last 7 years developing a script and shopping it around only to find himself making a last ditch effort to snag a recognizable actor for one of his main characters. He has to meet the actor in Berlin and impress him enough to want to do the project, failing to do so means certain death for his film and likely his ever frozen career. However going to Berlin would place him all too close to the girl who broke his heart. Yet to keep his struggling career afloat he has to make the meeting. Comically, the inspirational quote on his wall is from Charlie Brown, "This year I'm gonna kick that football." The girl that broke his heart is Lina (Linnea Saasen), a Norwegian dancer on the verge of starting classes at a prestigious dance school. Their previous relationship is shown in fragmented flashbacks showing the happy couple on the beach in Montenegro several years ago. Her secret as to why she left him with only a note saying, "lets leave on a high note" is one of the few things stringing us along for the first half of the film. When Anderson arrives in Berlin he inevitably runs into her and they both struggle somewhere between emotions of longing and the pain of lost time and separation. However, there is clearly still feelings between the two, but they seem to suffer from the lack of open honesty. It's very clear from fairly early on that it's the one thing holding them back. While in Berlin, Anderson stays with his friend Stephen (Rupert Friend) and his longtime girlfriend Friederike (Jennifer Ulrich). She's a confusing character whose characteristics and motivations seem inconsistent from scene to scene. Stephen on the other hand is much like what Anderson would become should his film fail. Stephen put all his money and resources into building his dream coffee shop, but when his funds ran out, he didn't have enough to actually open the business. Ever since, he's been in a state of arrested development, the fact of which has clearly gotten on Friederike's nerves. We can't help wondering how much their struggles might resemble the future for Anderson and Lina should Anderson's career crumble. However, Lina later reveals that she's had struggles of her own when it comes to chasing her dreams. Sadly rather than coming off as endearing, the romance at the heart of the film feels contrived. The shots toward the end as the credits roll show the real life couple (particularly Saasen) in a way that clues us in on the attempt to turn a romantic vacation into capital. It isn't all bad however, there is some nice cinematography and editing. Occasionally the film even stumbles onto some clever and insightful moments. Later on we discover the recurring artistic element of whimsical hand drawn renderings of images from the film are actually a part of a book he's been writing to document his journey. It's one of those elements that doesn't contribute to the story, but does add a finer sense of artistry. Yet despite this sense of style and artistry, the film suffers from uneven writing, which isn't helped by its weak characterizations. All of its mentions of filmmaking and storytelling serve only to betray the core "on again, off again" conflict of "will they, or won't they?" as the film winds down into its inevitable Hollywood-esque cliche of an ending (one they all too readily acknowledge, as if to turn it into a joke). The consolation to this cliche ending is the subplot involving Anderson's friends Stephen and Friederike whose love story is precisely the opposite of Anderson's. Where Anderson and Lina suffer from the separation caused by their individual ambitions, Stephen and Friederike suffer from the stagnation that comes from having been together too long with no ambition whatsoever for the future. These two relationships are examples of love travelling in opposite directions. 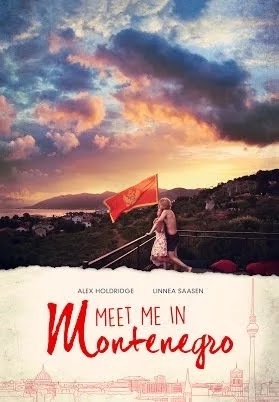 "Meet Me In Montenegro" has an interesting style that adds documentary elements to a standard indie romcom, and begs the question of whether or not this resembles the lives of the real life couple who wrote and directed it. It's not a bad film, it just doesn't live up to its potential. It also seems to be flying under the radar, but considering its an uneven film that seems to revel in its cliche ending, maybe that's not so strange.